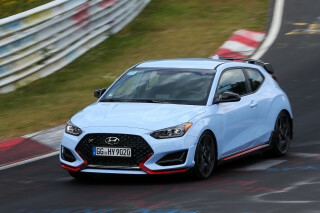 We’d aim for a 2.0-liter equipped GT Line for its features, or the 2020 Soul S for its value. The 2020 Kia Soul compact hatchback is proof of life among small, inexpensive cars. The 2020 Kia Soul hatchback scopes in its target audience by aiming at the fringes. Outre style, light-up speakers, and a low price speak to periphery shoppers who don’t mind trading style for substance. The Soul’s secret? 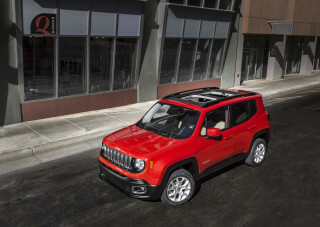 Its hatchback practicality, fuel-efficient powertrains, and quiet ride are right down Broadway for many buyers. This year, the Soul is new but retains the characteristics that made it a surprise hit in the U.S. The new Soul is available in LX, X-Line, S, EX, and GT Line trim levels. Kia hasn’t yet said how much each will cost, but base cars will start around $18,500 and top trims will tempt $29,000. The Soul’s sweet spot will be close to $21,000, however. This year’s Soul is subtly different than the car it replaced. It’s bigger by inches, but the same boxy profile has returned. We like the new face, which is more unified than the outgoing version’s split grille. Different trim levels wear different accents. Inside, the interior lights are higher and the speaker covers are different—but it’s still functional and comfortable for adults. The base powertrain is the best: a 2.0-liter that makes 147 horsepower mated to an automatic transmission. The Soul is hardly fast, but it’s agile around town and its gearing makes it a good urban runabout at slower speeds. The optional engine is a 1.6-liter turbo-4 that’s peaky and teamed with a finicky automatic transmission. We don’t recommend it. The Soul is also available with an electric powertrain that we cover separately. The Soul’s pride is in its packaging: it’s comfortable for four adults, with plenty of leg room for 6-footers or taller. The hatchback has an easy entry (which appealed to older buyers who snapped up the last generation in droves) and spacious cargo area that opens up to more than 60 cubic feet with the rear seats folded. It’s quiet down the road and more comfortable than its low price would suggest. Most Souls will be safe (we couldn’t help ourselves). Active safety features are included on S trims and higher and include automatic emergency braking and lane-departure warnings. Top GT Lines get the full house: blind-spot monitors, adaptive cruise control, and a head-up display. Base cars skip active safety and a few creature comforts but offer 16-inch wheels, cloth upholstery, a 7.0-inch touchscreen with Apple CarPlay and Android Auto compatibility, one USB port, and a low price. A big, bright 10.3-inch touchscreen is available on top trims along with more USB ports, a wireless phone charger and interior ambient lighting. The price of the 2020 Kia Soul isn’t the only thing that looks good. Graduated from its hamster days, the 2020 Kia Soul’s new style will still be familiar to most shoppers. 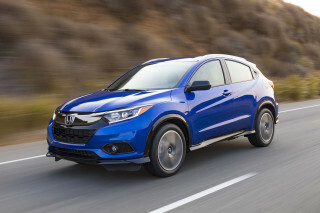 It’s a boxy hatchback with small twists that cleverly disguise from its budget construction. With the 2020 Soul, Kia didn’t rewrite its successful formula from last time around. It’s still a brick with a buzz, to us; Kia calls it a boar with a backpack. The trim levels diverge slightly: X-Line trims get chunky body cladding (but no more capability), GT Line trims get a unique grille and red accents on the exterior. Kia claims that its corporate grille has been planted in the Soul’s snout, but we don’t see it. Instead, the new Soul is smarter and more angular than the last version, playing less with its lines along the windows and more with its taillights. Depending on trim level, the Soul has one of three headlight configurations—we like the GT Line the best. Around back the Soul is the same, regardless of trim level, with wide boomerang lights that reach toward the top. Inside, most of the Soul is new, although the speaker lights return—in top trims. The speaker towers and doors are different this year, but a center touchscreen still dominates attention. Kia did well to cover the Soul’s economy car roots with dashes of flavor: the speakers run close to the door handles with silver accents, the black accent in the rear roof pillar is stamped with a “Soul” name. The 2020 Soul nails its performance mission: affordable and agreeable, without feeling cheap. Despite its price, and commuter-car aim, the 2020 Soul doesn’t dull drivers with a perpetual-Monday feel behind the wheel. The small Kia is bright and comfortable but doesn’t sacrifice fuel economy with gobs of power or substantial girth. Two engines are offered in the Soul this year, down from last year. The base Soul is powered by a 2.0-liter inline-4 that makes 147 hp and 132 pound-feet of torque. It drives the front wheels only through a 6-speed manual transmission, or more commonly, a continuously variable automatic transmission (CVT). 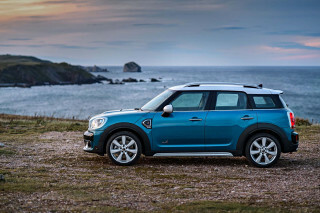 It’s the better of the two powertrains available in the Soul, and also the cheapest. The fuel-saving CVT has a secret: it’s better at low speeds than higher speeds, which makes the Soul more comfortable around town. There’s a sport mode that stiffens the steering slightly and revs higher, but normal is more the Soul’s speed. Compared to the top-shelf, turbocharged engine, the 2.0-liter inline-4 feels a little pokey but we wouldn’t trade pace for the 1.6-liter’s petulance. The 1.6-liter turbo-4 optional in the Soul GT Line makes 201 hp and 195 lb-ft, which is a considerable jump from the base engine. For the trade, drivers get a peakier engine that delivers power in a chunky way. It’s fun to wind up the turbo at highway speeds, but at slower speeds—read: around town, or in stop-and-go traffic—there’s less of a difference than 36 percent more horsepower would suggest. Part of the issue is the turbo’s 7-speed dual-clutch automatic transmission that we’ve taken issue with before. At low speeds, the automatic feels like it hesitates—even rolls back in traffic—and at moderate speeds the shifts can clunk through gears. Owners have reported that the problems get only more pronounced as the car ages, and we have difficulty recommending any of its applications. The Soul’s ride is calm and composed, edging closer to comfort than we’d expect from an economy car. Despite riding atop a suspension setup that’s typically known for its low cost instead of low turbulence, the Soul was calm on a variety of road surfaces. Our turns behind the wheel came behind GT Line and X-Line cars, which both feature tall, 18-inch wheels that can stiffen rides. We didn’t notice any harsh rides, and even with the GT Line’s stiffer suspension settings, the ride was still supple. The Soul steers with confidence, although it could be a little heavier than expected. Generally speaking, we like heavier steering feel, if only because it feels more confident. The Soul tracks well down the highway, but between the 2.5 turns from lock to lock, there’s not much buildup in the wheel in a way that we’d like. Forget the number; the 2020 Kia Soul is spacious and comfortable—a relative rarity. Don’t be fooled: the 2020 Kia Soul is remarkable in its efficiency of space and room for a tall-riding hatchback. Five adults fit within the small car, with ample leg room in the front and rear for NBA-sized passengers. (Four’s better with broad shoulders, perhaps.) Behind the second row, more than 24 cubic feet of cargo room is available with the seats up, or 62.1 with the second row folded flat. There are numerous cubbies and shelves, and the seats are comfortable for adults, too—even base versions. Up front, the Soul’s seats are thickly padded and all-day comfortable. Most cars get six-way manual adjustments with enough seat travel for drivers seemingly wearing stilts. The front seatbacks may pinch the broadest of frames below the shoulders, but it’s not uncomfortable—congrats on blasting your lats at the gym. The rear seats are a marvel. Behind 6-footers, rear-seat riders can be 6-footers themselves and their knees will never touch the front seatbacks either. Three abreast is possible in the Soul—good news if one arrives as your ride-share on Friday night—and children will easily fit. The door cutouts for the rear seats are mildly awkward, watch your dress ma’am. Behind the second row is a generously sized cargo area with an available floorboard that can raise or lower to offer a flat loading floor from the hatch, or an additional 0.8 cubic feet of storage space when lowered. The liftover height is deceptively tall and the hatch is just a little too low for 6-footers to stand upright beneath it. The Soul’s fit and finish isn’t luxury grade, but it’s not poor either. In most trims, the funky hatchback has solid materials that feel durable and cleanable—although they wouldn’t be as interesting without the quirky speaker panels and shapes. Top GT Line trims separate from the pack with a large, slick touchscreen, illuminated door speakers and unique instrument cluster. It’s a bucks up feel for a cheap car, if you can afford it. We’d rather not ruin a 2020 Soul, we’ll wait for the feds instead. Aside from standard safety equipment, which includes six airbags and traction and stability control systems, most 2020 Souls will be equipped with lifesaving active safety equipment. Automatic emergency braking, lane-departure warnings and blind-spot monitors are standard on all but base Soul LX. S trims or higher add active lane control, and a driver-attention warning if the car drifts from its lane too often. GT Line models, when equipped with the turbocharged engine, get the full boat: pedestrian detection, adaptive cruise control, and a head-up display. Outward vision in the tall-riding hatchback is generally good, except toward the rear where chunky roof pillars can obstruct blind-spot views. Base models skip the good stuff, but the 2020 Soul can be well-equipped without spending a fortune. Cute may be the Soul’s calling card, but the good stuff isn’t hard to find. This year the Soul is offered in LX, X-Line, S, EX, and GT trims. A Designer Collection upgrade for the EX version adds bigger wheels, synthetic leather, upgraded headlights, but no runway strut. The top model, a GT-Line with 1.6-liter turbo-4 rings the bell at more than $28,000, but the Soul doesn't have much value more spacious rivals at that price. Top trims are impressive, too, although we’re not sure may buyers will go there either. The Soul GT-Line with the 1.6-liter turbo-4 adds synthetic leather upholstery, 18-inch wheels, a slick 10.3-inch touchscreen for infotainment with smartphone compatibility, two USB ports, a wireless smartphone charger, keyless ignition, premium audio by Harman Kardon, active safety features (that we cover above), a head-up display, and speaker lights. Those cars will be a big step up in available features—and in price. The GT-Line with the base engine is a better deal at just over $22,000, but it doesn't offer the impressive 10.3-inch touchscreen or synthetic leather upholstery. Ask us to spend our own money and we’d step over the GT-Line to S versions that cost the same as the GT-Line 2.0, and add to the base model 17-inch wheels, active safety features, and upgraded cloth upholstery. 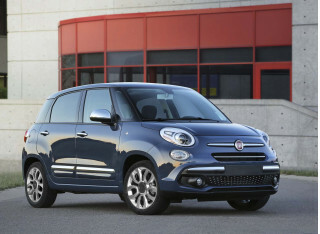 EX trim levels are tempting, but likely crest $22,000, where the Soul’s value starts to fall down relative to others. Good news, thrifty commuters: The 2020 Kia Soul is fuel-efficient in every configuration. 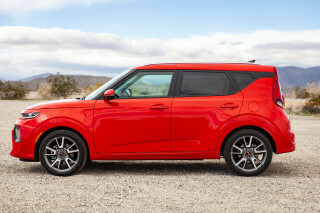 The 2020 Kia Soul is fuel efficient in most configurations, but the base powertrain that most shoppers will consider is the most frugal. The base Soul rates 27 mpg city, 33 highway, 30 combined with an automatic transmission, according to the EPA. Manual-equipped Souls are not only rare, they’re also the thirstiest: 25/31/27 mpg. The turbocharged GT version is automatic-only and rates 27/32/29 mpg. This year’s Soul EX gets “eco” badges and a 29/35/31 mpg rating. The Soul EV is black belt eco, however. The EPA rates its electric range at 243 miles, although we rate it separately.